Rabbi and Donna, It's hard to believe that you are moving on to new adventures and experiences. When we first joined the Temple, you both made us feel welcomed. We have always enjoyed your sermons and the way you explain the simple to make it interesting. During the years that have followed you have been a guiding source and comfort to us. It's not hard to understand why you are both so loved by our community. We wish you all the best in whatever comes knocking on your door. Thank you for all you have done for us and our family. We are all better for knowing you. As a somewhat new member of the Schaarai Zedek I can’t say I know you very well and I have no stories to share. However, I can say that from what I’ve seen I believe you to to be one of the finest rabbis I have ever met. I feel honored to have had the experience of your leadership, sincerity, humility, wisdom and positive attitude at the Temple these past four years. All the best. 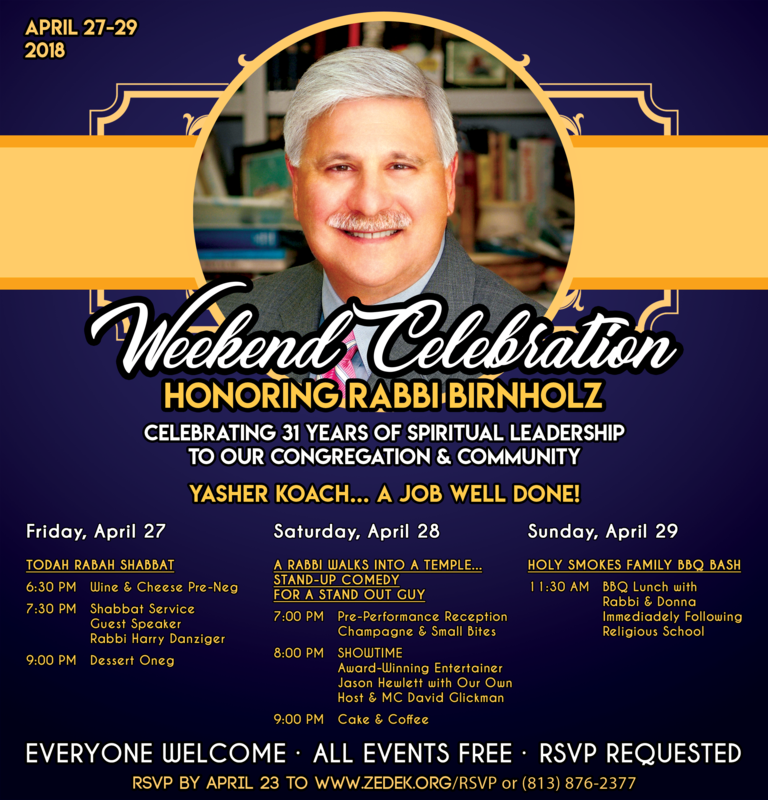 Dear Rabbi and Donna: I am very sorry that I was not able to join you for your Weekend Celebration but here is my wish to you both for a perfect and certainly well-deserved retirement. I know you will still be a very important part of the Schaarai Zedek community so I do not have to tell you how much I would miss you...a very good thing because there are no words! A good Rabbi and Rebbitsin are hard to find. And don't forget to have fun! Richard and Donna for more than 25 years our family and yours have shared a special bond. We have had the great pleasure of spending many enjoyable evenings, holidays and family occasions with you both. Our very sincere wishes for a happy and healthy next 35 years as you begin your lives in retirement. We came to Schaarai Zedek and have never left. The caring and inclusive environment as congregants that we felt is a testimony to your leadership. The team that you built has enabled Schaarai Zedek to grow and become the area's leading congregation, pre-school and religious school. Our children have grown up in Schaarai Zedek and now their children Steven and Sydney are members of the congregation. Todah Rabbah. Harriett, Larry Steven, David, Ami, Sydney Cyment and Samantha Cyment Oliver. G_D bless you both. As you retire it is important for you to know that you have truly made a difference at Congregation Schaarai Zedek. You have truly made a difference in my life! No one can take your place! For the years ahead, here is wishing you not only exciting challenges but also laughter and deep contentment. You will be missed! I will miss you! CSZ- a place where everybody knows your name. Well, maybe not everybody, but you Rabbi, certainly remembered my name and profession from when I first met you on a canoe trip to years later when I finally made the decision to join CSZ. That remembrance, the friendliness of the people I've met, and the varied choices of activities helped make my decision to be part of CSZ a good one. I hope your next move from active rabbi to Rabbi Emeritus also includes a stint on America's Got Talent for stand-up comedy. Thanks for the memories, thanks for the laughs. Mazel Tov on your retirement from Elaine and Geoff Gross. Rabbi and Donna, I know I speak for Mark, Jennifer and Jason too when I express how important you are to our family. We love you dearly. Rabbi, here is the message I read to you at the Past Presidents Dinner on Thursday night...An excerpt from the book, Northanger Abbey by Jane Austen..."Only a Novel"...in short, only some work in which the greatest powers of the mind are displayed, in which the most thorough knowledge of human nature, the happiest delineation of its varieties, the liveliest effusions of wit and humor are conveyed to the world in the best chosen language...Rabbi, your 31 years here...is your novel. You have touched every life with your generous nature, your wondrous wisdom, your breadth of humor, and your genius for imparting YOUR perfect most meaningful words for any given situation. You genuinely love and care about each and every human being and God is smiling, all knowing, of your bountiful work, deeds and accomplishments. And so, I say...your novel...your greatest powers of mind, your most thorough knowledge of human nature, your happiest delineation of its varieties, your liveliest effusions of wit and humor are conveyed to OUR world in the best chosen language...through you, Rabbi Richard Birnholz. It is my honor and privilege to have served with you in a chapter of your life.